Leadership PACs fund political travel and make contributions to candidates and party committees. The committees' federal accounts can raise money in contributions of up to $5,000. Some of the committees (Daschle, Edwards, Kerry and Gephardt) also have separate Section 527 accounts which take non-federal (soft money) contributions; these 527 accounts have no contribution limits and can accept contributions from corporations and unions. They report to the IRS rather than the FEC. Committees can transfer money from the nonfederal 527 accounts to their federal accounts for joint activity. A noteworthy development in the first quarter came on March 27 when President Bush signed campaign finance reform legislation, however the new law will not take effect until after the November 2002 elections. In the table below, federal and nonfederal accounts are shown on separate lines. The federal account receipts are broken out to show the federal money raised, the nonfederal money transfered in, and the total as shown in the FEC report. The Section 527 (nonfederal) disbursements includes the money transferred to the federal account. Finally, the grand total of federal and nonfederal dollars raised by the PAC is shown in a third line. In addition to leadership PACs, some of the prospects are raising money for their re-election campaign committees. Left-over money from 2002 federal re-election campaigns can be transfered directly to later federal campaigns, such as a 2004 presidential campaign. Another type of committee is the joint fundraising committee, an example of which is the Daschle Victory Fund. Some of the leadership PACs have amusing names or acronyms (then-Sen. Bob Kerrey managed to come up one of the best names back in 1998 when he launched Building America's Conscience and Kids or BACK PAC). 1. Gore raised almost all of this sum in a round of seven Leadership '02 events. He held his first Leadership '02 fundraiser in Arlington, VA on Feb. 19; and subsequent ones in Washington, DC on Feb. 22; Miami and Fort Lauderdale, FL on Feb. 27; Washington, DC on March 4; NYC on March 6; and Boston, MA on March 21. 2. Daschle did no DASHPAC events in the first quarter; he typically does one large event in late Spring (likely early June this year). Daschle's Section 527 (soft money) total of $95,000 came from nine $10,000 contributions and one $5,000 contribution. The Daschle Victory Fund is a joint fundraising committee formed by Daschle in March 2002 to help Democratic Senate candidates on a rotating basis; Daschle's re-election committee gets 1 percent of the proceeds. It held a fundraiser on March 18 from which it transfered $27,047 to Mark Pryor (AR) and $27,047 to Jeanne Shaheen (NH) and $26,101 to Strickland (CO). 3. Dean raised money for the Fund solely through personal phone calls - he did no events or fundraisers. Included in the 21 contributions the Fund received were two $5,000 contributions, one $2,500 contribution, one $2,000 contribution, and 11 $1,000 contributions. $8,400 of the money came from Vermonters. Explaining the relatively small receipts, Kate O'Connor, treasurer for the Fund, said there is "a different philosophy" behind Dean's Fund as compared to the other leadership PACs that are raising significantly larger sums. O'Connor said purpose of the Fund is for Dean to be able to travel around and support candidates, and he doesn't need a large staff and millions of dollars to do that. 4. The Optimists' federal account showed it received 59 contributions. 33 contributors gave the maximum $5,000. $64,800 of the total came from North Carolina. Edwards' Section 527 (soft money) total of $471,000 included two $100,000 contributions--one from attorney Wade E. Byrd of Fayetteville and one from attorney John E. Williams, Jr. of Houston; two $50,000 contributions--one from the New York law firm of Weitz & Luxenburg and one from attorney Wayne Hogan of the Jacksonville firm Brown, Terrell, Hogan, et al. ; $25,000 from TV programming executive Haim Saban (Mighty Morphin Power Rangers); $20,000 from San Antonio attorney Pat Maloney, Sr.; two $12,500 contributions; and two $10,000 contributions. Adding the Optimists' total $659,406 and the $310,341 raised for his 2004 re-election campaign, Edwards' grand total for the quarter was $969,747. 5. Gephardt's Section 527 (soft money) account garnered 11 contributions totaling $66,500. Included in this amount was a $25,000 contribution from NY attorney Pamela A. Liapakis, a $15,000 contribution from Kulite Semiconductor president and CEO Anthony D. Kurtz and a $10,000 from Fisher Scientific International of Hampton, NH. 6. The great majority of the money raised by Kerry's Citizen Soldier Fund came from a single fundraiser he held on March 22 at his vacation home in Sun Valley, Idaho. Kerry's Section 527 (soft money) total receipts of $79,000 included five $10,000 contributions, five $5,000 contributions and two $2,000 contributions. Kerry's re-election campaign raised money primarily through direct mail; in addition a March 11 "Salute to Senator John Kerry" fundraiser at the Boston Sheraton Hotel featuring five women U.S. Senators brought in about $200,000. 7. Lieberman did 11 fundraisers in the first quarter to raise this sum. Sign on the door of the Leadership '02 event held in Washington, DC on Feb. 22, 2002. 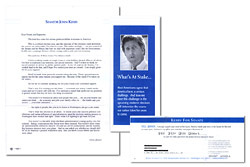 Direct mail piece from Sen. Kerry's re-election campaign, early 2002.